This Heaven Goes to Eleven is Backdraft's third album, but my first experience with the talented Swedish band. The first offering from the band, Here To Save You All (2001) was described as 'southern metal' side, receiving generous praise across the Continent. However, listening to This Heaven Goes to Eleven, I'm not necessarily hearing 'metal' or American 'southern' rock. Instead, This Heaven Goes to Eleven is rather eclectic. It's hard rock, and melodic with a certain flavor of that Southern style. You can hear it on The King of Diesel, E.C.G.T. Blues, and Out of Here by example. But this is not Kid Rock messing with country rock or even a Garth Brooks attempt to bring country to the rock arena. No, THGtE is more varied; the sound derives a much from late 70's to early 80's hard rock like Aerosmith and Lynyrd Skynyrd, but also, surprisingly and for a stretch, Kiss. You're probably scratching your head at this point. What the hell is he saying? And I don't blame you. Let's only mention some highlights, songs that charmed my ears and persuaded me to Backdraft's zeal. Idiot is radio-friendly pop, strangely heavy, country-jerked, rock. Yesterdays & Tomorrows along with Flipside rock and twist with a vibrant groove. Yet, No Love, Wheel of Fortune, and also radio-friendly cleverness of Out of Here, both obscure category and entertain. 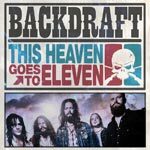 Backdraft's This Heaven Goes to Eleven finds the band in good form: combining classic melodic hard rock with a bit of Southern rock. Backdraft is maturing and the result is positive and entertaining. American readers need to find the digital download: you will not be disappointed. Quite recommended. Ultimately, Kingdom Come's Rendered Waters and their hard rock legacy will continue to be debated ad infinitum. Fans will love this work I'm sure. To the remaining critical and reluctant few, here's some simple advice: give Kingdom Come 2011 a listen.